The world knows Vancouver as a prime vacation spot. Visitors might come from far and wide for the gorgeous views, hiking trails and winter sports but staying put takes work! Making homes within city limits means creating a maintenance program that keeps up curb appeal while improving the condition of your property. 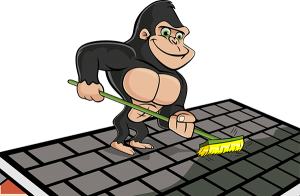 When necessary maintenance happens to be out of reach, just call a Gorilla for your Vancouver roof cleaning and moss removal. Proper roof cleaning services remove moss and algae from rooftops safely and professionally. Setting foot on your roof is a dangerous undertaking, but so is ignoring it! Roofs might be the first, last and strongest line of defence against the outside elements, but these surfaces need a bit of help to keep going! No matter what part of the Vancouver area that you call home, roof clutter is unavoidable. Organics do not have a strict schedule for themselves but fall consistently throughout the year. Leaves, sticks, and small, dense materials fall from tree tops onto the roof of home and businesses in your area. As clutter builds up, it not only looks terrible, but it can lead to roof moss. In Vancouver, the winters are the warmest in all of Canada but also the wettest. With an average annual precipitation of 62.5 inches in the downtown area, water is hard to avoid. Moss, lichen, and algae thrive in this damp and shady environment particularly on the north facing roof top areas and/or heavily treed areas of your property. Overhanging trees give shade while shedding moisture-retaining debris, but also allows moss spores to be easily transferred to the roof. Clients who make regular use of our moss removal services can see a huge improvement quickly. Moss and debris collects along the surface of your roof but it is crucial to avoid it spreading. Dealing with a cluttered roof, moss removal, or just general maintenance of your roof system, is a precarious job. A professional roof cleaning company will address the safety of both our staff and your property. If performed improperly moss removal can cause a lot of damage. While heavy-duty solutions like power washing might seem like a great idea, they are too powerful for some materials. These tools might be able to strip algae but soft washing gets roof moss free safely and effectively. High pressure roof cleaners can cause breakage to sensitive materials like asphalt roofs. Our Gorillas carry out your maintenance needs as a registered member of WORKSAFE BC. Safety and maximizing your property’s potential are paramount to our Gorillas. Safety equipment is inspected prior to starting any project. Following the installation of equipment but prior to commencing the service, a walk around of the property is performed. Clients love the aesthetic improvements to their properties. Not on that, but you are extending the life of your roof.